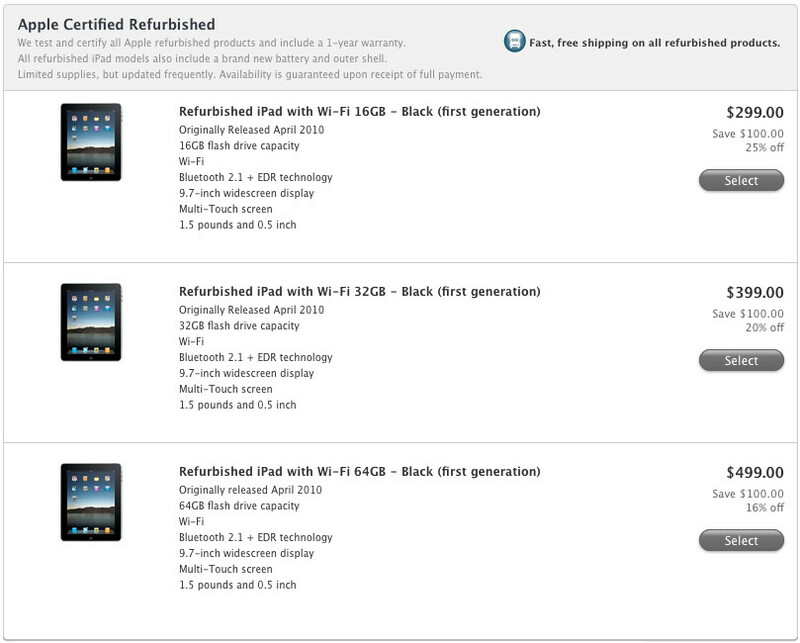 The Apple certified refurbished store has been filling up with O.G. iPads that Apple is looking to move. The stock does fluctuate because it is the refurbished stock, but all original iPads have been marked down $100 making the original Wi-Fi 16GB model a mere $299. While that may not seem like a huge discount at first glance, it is 25% off and, remember, Apple is the company whose idea of a Black Friday sale is a whole $41 off a $500 iPad. Also, Apple refurbished products come in new shells and carry the same 1-year warranty that a new product gets, so if you’re looking to get into your first iPad on the cheap, it’s a decent deal. The sad part is apple can get away with selling the OG iPad for $300 while other companies can only max out at $300 for a new 2012 tablet (loaded with the latest features) and still struggle to sell it. 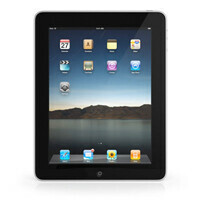 Apple is just simply dominate in the tablet market. The original iPad should be phase out. I don't know how it would be. Suppose you go to Apple store and want the new iPad but you forgot to mention the new one and just say you want an iPad. Now if the salesperson doesn't ask you whether it is old or new one then you're screw. If you go in store to purchase an iPad, more than likely you have in mind which one you want so it wouldn't be that hard to get the one you want. Also, I doubt an employee isn't going to ask you which one you want before he/she heads into the back to grab one for you. If you go up to an employee and say, "Hey, I want an iPad" why don't you think he/she wouldn't ask, "Which one would you like?" Edit: Also why phase it out if you have customers willing to purchase it and it still gets support from Apple? for only 300 bux, you can have a cheap ipad with no camera, crappy screen, single core, and even less. yet for 300 on android you can have yourself a monster of a tablet that does a hell of a lot more. why do people encourage apple's pricing by buying that crap? geesh. Agreed, for $300 I'd consider signing a contract with AT&T for the Galaxy Note which 'DOES' everything crApPad doesn't. "Because it's Apple." is most of the answers you'd get. It might be old but it's still show-offable. Yea at Best Buy you can get a used Motorola Xoom for just 30 dollars more than this. Better larger screen, dual core processor, 32gb vs 16gb, and of course Android is the way to go anyway. @remixfa Again another striking good points! the bulk of windows8 should look and run like WP7, with a seperate windows7 style desktop mode built in. I really hope it works well as I could use a tablet with real PC functionality, not just these over sized smartphones that are the vast majority of the current market. The reasoning behind Apple's successful sales, is the fact that people continue to buy it. I just don't get this generation. My generation purchased products that offerered decent quality and more for our money. This generation is motivated by status. I just approached my Nephew the other day and pointed out how much more my Sister's ASUS could do at much faster speeds over his iPad2. He said he didn't care. It's an iPad. Great argument. It really breaks down the logic. As it stands, the competition is quite in tune with what the iPad is doing. So, they are pulling out all the stops and concentrating on quality and offerings. Yet, because it doesn't have a bitten Apple, people won't purchase it. These people are not realizing what they are possibly missing out on. Apple releases this "New iPad" and it is on the verge of being outdated already by the others. I don't know about everyone here, but I want more for my money. That is how computers have always been judged. Apple has successfully planted that you should pay more for less. John B. Exactly, the worst part about it is last time, people clearly saw that OSX was a functionless piece of crap that doesn't have a place in the IT world. And god know when it happened but somehow people got dumber and somehow equated less functions to simple to use. And that really gets to me. and it only got worst as years went by and suddenly the close to functionless iOS became a norm and anything that has more functions is complicated. people continue to buy it b/c its not only status that draws people to it. apple has a reputation of being a solid, reliable brand. that's what keeps people coming back. 25 billion strong apps & not one report has been made that an app causes an issue with the software. android loyalists always approach the apple conversation from the angle of what apple is lacking without looking at what it does well. reliability & functionality trumps features with any thing. its the same concept with televisions, cars, etc. i'm not sure why people are so perplexed by this. but then again, i'm not biased...which i think a lot of android users don't understand the bigger picture b/c they can't see beyond their own screen of bias. what people define as "more for their money" holds a different definition for everyone. apple created a household name w/the iPod. so pretty much from there if you put an "i" in front anything now people will buy it b/c it all started with a device which revolutionized how we accessed and utilized music. if you recall there were various types of mp3 players that did what an iPod did but wasn't as successful and mostly viewed as knock offs. its almost the same concept as with the tablets. android's problem is that they have created a software that appeals to only a certain user. apple's success is that they created a software that appeals to most everyone. android users throw cheap shots at apple b/c the reality is that there's nothing else that can be said. the momentum is obviously there & doesn't seem to be going anywhere anytime soon for reasons that are beyond the "apple is for dummies" theory. thats not true at all. there are tons of issues with app compatibilities. its also not immune to slow downs and freezing either. the big difference between android and iOS, is that on android updates are automatic. when an OS update is ready your phone lets u know and does it for you.. when an app update is ready, it just updates itself in the background. Neither one of those things happen on iOS. So it has to count on the user being educated enough to check for OS updates and manually download app updates. Thats a paradox considering one of its largest user groups get it because its supposed to be "simple" that non computer literate people want to use it... That also makes for quite a few app issues. ----" people continue to buy it b/c its not only status that draws people to it. apple has a reputation of being a solid, reliable brand." ---- CRICKETownz, Apple has been around for 30 years and has always had a reputation for being simple and reliable. People didn't buy into it because Apple's simplicity and reliability came with a compromise. Sound familiar? Yes. Their DNA has not changed. The compromise is still there. What has changed, is that Steve Jobs' ability to eloquently market the product to the point of saturation. Sheeple marketing if you will. His tenure at the helm of Apple was not just to sell Apple to the masses, but to also discredit Android as a competitor. Is Android's stability really far below Apple's "seemingly perfect" OS, or is it that individuals perceive it as such? Both OS' in their unmodified state are arguably very stable platforms. The issue comes into play when Android's customization allows individuals create their own mistakes or should I say; viral infections. Again, does this sound familiar? Yes. Windows. People learn from trial and error of what and what not to download. Apple does not give society that ability unless individuals modify the OS. At this point, Apple's OS is breached and fragmentation becomes imminent. It's all relevent to how Apple markets their product and how people buy into it. John B.